So we are traveling to Venice and then on to Slovenia and Croatia. It makes a nice triangle of travel. Two other couples are joining us for this trip, one of which is of Slovenian descent. He will meet with some of this relatives. As always when I travel, I like to write about the gun laws where I find myself. So let's take a look at the Italian version of guns, gun laws and gun violence. About 7 million Italians own guns. According to the link, Italy is 15th in the world when it comes to gun ownership. Italy had 798 gun deaths in 2010- about 1.31 per 100,000. Most of their gun deaths, as in the U.S. are due to suicide. There were only 53 unintentional gun deaths in Italy in 2010. There are some gun manufacturers located in Italy. I used to tell people that you can’t even own bullets in Italy, let alone a gun, but that isn’t exactly true. In this duly elected democratic country of Italy guns and bullets are not outlawed, but they are strictly controlled. The Italian Constitution does not recognize a citizen’s right to keep and bear arms. There are strict rules about who can own a gun and for what purpose. Private ownership of military style weapons (e.g. machine guns) is strictly forbidden and military ammunition is also forbidden. Guns are also limited to a certain capacity (e.g. maximum 15 rounds in handguns), and there are also restrictions on the total amount of ammunition which can be owned and how and where guns must be stored (e.g. in a locked cabinet). All private firearms must be registered at the local police department within "72 hours" after purchase or transfer. This time limit starts from the time the firearm is actually taken to the place where it is to be registered, for example, the firearm may be bought on a certain day and picked up a week later from the retailer; only then is the owner required to register the weapon. Citizens are allowed to own: up to three common firearms ( such as 10-gauge shotguns, and some .22 rimfire rifles), and up to six weapons that have been specifically engineered and/or manufactured for shooting sports. An unlimited number of hunting weapons (both rifles and shotguns) and up to eight antique or historical weapons (designed before 1891, regardless of when produced). In addition, an unlimited numbers of single shot muzzle loader replicas, are allowed with no registration needed. An unlimited numbers of airguns under 7,5 Joules of muzzle energy, specifically approved by the Ministry of Interior, do not require registration either. In Italy it is illegal to carry any type of weapon in a public place, but the law provides the following exceptions: A hunting license, along with a special hunting permit issued by the region of residence, allows Italian citizens to carry hunting weapons only during hunting season and only within the confines of game reserves. When transporting them outside game reserves, the shotguns must be kept unloaded and locked in their case. A concealed carry license allows a citizen to carry a handgun for personal defense; this license is usually much more difficult to obtain than other firearm licenses, and must be renewed every year (while hunting and shooting sports licenses are valid for 6 years), and the applicant has to provide a valid reason to carry a concealed gun (e.g. a salesperson of valuable goods such as jewelry). So things are quite different in Italy pertaining to guns, who can buy them, how many can be owned, where they can be carried and requirements for registering the guns with the government. God forbid. People in Italy have to register their firearms. What next? Surely they will be confiscated next, right? Wrong. The American corporate gun lobby loves to insist that gun registration will surely lead to confiscation. It's natural. And woe unto whoever tries to challenge this infamous myth and outright deception. Anyway, we don't hear about many shootings in Italy. They do happen obviously but very infrequently. That's because as a country, there is some common sense regarding the role guns play in their society. There is no second amendment. No hysteria. No hyperbole. No fear and paranoia. And yet, the country still exists and people still manage to live their lives. Surprised? And yet there are reasons to believe that Renzi, the leader of the center-left Democratic Party, will prove to be one of the more intriguing and long-lasting figures in Italian politics. At thirty-nine, he is the youngest Prime Minister in Italian history—younger even, by a couple of months, than the young Benito Mussolini when he was asked to form a government in the wake of his March on Rome, in 1922. Renzi’s youth matters because Italy is a country that has devolved into a gerontocracy: positions of power are occupied by men in their fifties, sixties, and seventies, while youth unemployment is above forty per cent. The job market is bifurcated between extraordinarily well-protected older workers who cannot be fired and younger people working on “precarious” temporary contracts, often making about a thousand euros (less than fourteen hundred dollars) a month. An astonishing percentage of young people live at home well into their thirties, waiting for a full-time job and the opportunity to marry. The most ambitious and energetic seek their fortunes overseas—in the U.K., France, or the United States. American universities are filled with brilliant young Italian academics who find it easier to break into the U.S. system than that of their own country, which functions, much like the country’s political system, according to the principles of cronyism, nepotism and seniority. We have traveled to many countries where the unemployment rate is high and young people are struggling. It's hard to know the underlying problems while enjoying the beauty, history and culture of so many interesting countries. We traveled to Italy in 2006 on a trip to Tuscany and Umbria and fell in love with that part of Italy. Venice will be a totally different experience and one we have not had since we traveled many years ago just out of college. 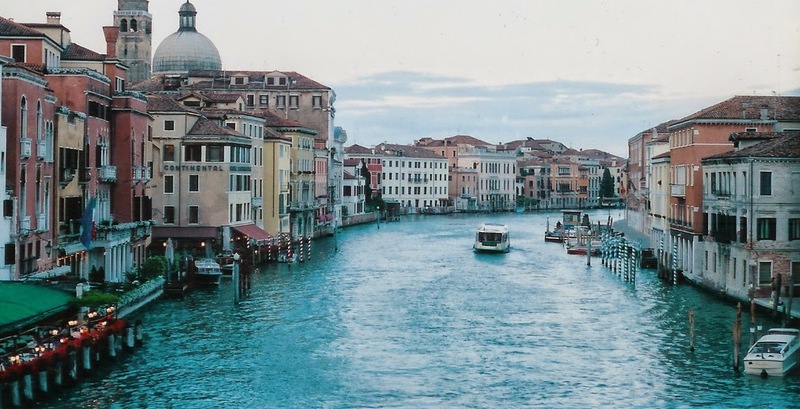 In spite of all of that, we intend to enjoy the usual wonders of Venice, including a boat tour of some of the islands nearby where glass blowing takes place. I know we will enjoy the food and wine as well.